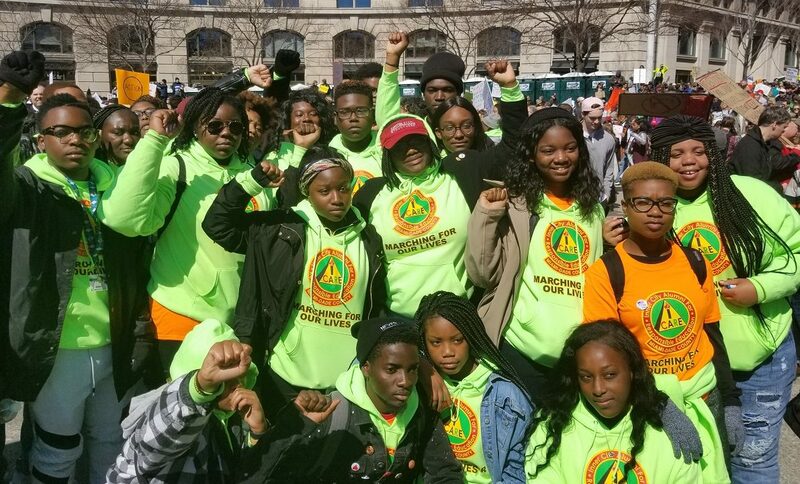 With grant support from The Miami Foundation and others, a group of about 40 students of color went to Washington, D.C, and attended the “March For Our Lives.” Along the way, they took part in a town hall at Ebenezer Baptist Church in Atlanta and visited the Smithsonian National Museum of African American History and Culture. One student shared her story. The “March For Our Lives” in Washington, D.C., was more than a chance to march for justice on gun violence … it was an opportunity to speak and be heard. I traveled with a group of about 40 Miami-Dade County Public Schools students who, like me, are black minorities from communities in Miami, such as Miami Gardens, Liberty City, Allapattah and Opa-locka, which are all too familiar with shootings. Yet, these incidents don’t always receive the same media coverage when they happen. Gun violence has been tearing our lives apart for years. It should not have taken the Parkland incident for everyone to finally realize that gun laws need to change. Inner City Alumni for Responsible Education (I C.A.R.E) and other organizations arranged funding for the trip. Valencia Gunder, or Aunt V as we call her, mapped out an itinerary for us that included a town hall at a church in Atlanta and a trip to the National Museum of African American History. We left for Washington on Thursday, March 22nd. The bus ride, with people I didn’t know, changed my perception and widened by awareness. I heard stories of how families had drastically changed after losing a father, brother, daughter or sibling to a bullet. Sixteen hours later, we pulled into Ebenezer Baptist Church. There, we took part in a town hall with other students and organizations. We shared similar thoughts and talked about solutions that could bring about the change we wanted to see in our neighborhoods. One student described how she wanted to write textbooks to help urban youth learn their history. Another girl said she would build community gardens. It was an enlightening discussion. Afterward, we hopped on the bus and headed to North Carolina, where we stayed the night, and spent Friday traveling to D.C.
On Saturday, the day of the march, we all wore matching bright green hoodies. We rode D.C.’s metro rail to get there. The march was a life-changing experience. We marched for OUR lives, our colored brothers and sisters. We chanted: “One, we are the people, two, a little bit louder, three, we want justice for all students, three, three, three, 305, march for our lives.” Marching for something so important for the first time in my life revealed a side of me I wasn’t familiar with. It didn’t stop there. Later that night, we got together with other students from across the country. We jammed, we danced and we enjoyed each other’s company. The next day, we had the honor to explore the African American history museum. I will never forget that visit. It was powerful to learn and see for myself the revolutionary obstacles, the ambitious movements during the 1900s, and the successes and failures of the Black African-American race all throughout the course of history. In between those four days, I got to build a network with those around me. We formed bonds. I felt productive as a young leader. I also touched snow for the first time. We finally had the spotlight. Thank you to those who believed in us and supported us to be greater than we ever envisioned ourselves to be. And to my fellow students, thank you for believing in and fighting for change … for ALL teens throughout the entire country who were not there. Rose Stephanie Jean-Paul is a junior at Miami Central Senior High School. Rose Stephanie, what an amazing initiative. Can we support you? 16+Vote works with schools and other organizations to bring voter registration tools and supplies to make registering fast, easy and convenient. If you are interested in collaborating with us, create an events or want us to come and set up voter registration, please reach out. Reach me at 786.367.6829.